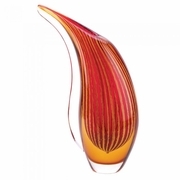 A sparkling freeform vase celebrates the beauty of an autumn sunset, setting your surroundings alive with vibrant color. This abstract artwork is lovely alone, but especially stunning when filled with a graceful bouquet! Decorative purposes only. Each piece is individually hand-crafted for its unique beauty; therefore, it may have slight differences from the pictured item. Glass. 7 1/2" x 3 1/2" x 12 1/4" high. Note: Each of these pieces is individually hand-crafted for its unique beauty. Because these are one of a king, your item may contain slight differences from the picture shown.